This is my second bike, my first cruiser. And wow, is this baby fun. I've had it about 3 weeks now. Just got it out of the shop for badly needed carb adjustments, tune up and fluid change. I've only been riding a couple of years, all of them on my other bebe, a 97 ZX6R Ninja. I'm still getting used to the difference in riding dynamics from a sport bike to a cruiser, but I'm really enjoying the comfort factor on the Yama. I found it on Craig's and she just screamed girlie. Someone had put a ton of money in aftermarket upgrades and custom paint, cobra pipes, Mustang seat, amp and speakers for Ipod. I can't say enough about what an awesome bike this is. I'm 5'4", fairly stubby legs and I've got no problem maneuvering this bike around. It's got plenty of power to keep up with my husband's electra-glide. I haven't tried it yet, but I could probably dust him on the line, but he'd get me on the other end with his bigger motor. It's got great balance, no top heavy issues with the Memphis Fats windshield. I may put a batwing on it if I ride during the winter for better protection from the cold. I'm looking for a tour pack, but haven't decided on one yet. I get to park my 07 Duramax Crew Cab truck during the week and save me a fortune in fuel commuting to work. I have a 2002 v-star classic with about 26000 miles on it. The end of September a buddy and I are headed from Alabama to Tulsa to hit route 66. Then on to the west coast and back. We are allowing for 16 days with site seeing. Looking forward to it but we know it will be a long trip. We are both welol into our 50's but have been riding most of our lives, need to do this one while still able. I also have the 2002 VStar 1100 I bought it the end of 2009 off Craig's list. Mine is the Classic with the long fenders. I also lucked out because the prior owner was short and had added risers to the handlebars a lots of other goodies. We just finished a long ride over the 3-day Memorial weekend. We rode from SW Florida up to the Panhandle (Mexico Beach) and then across to Tallahasee and back down to home to beat Hurricane Beryl. 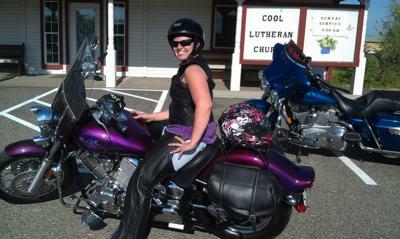 The other gal rode a 2004 VStar 1100 and both our husbands ride the Royal Stars. In the long straight stretches I tease that the bike rides itself it is so comfortable & steady. I LOVE the color of your bike! Have lots of fun this spring & summer! Hi Char. Thanks, its a lot of fun. We just got back from an afternoon in the mountains. The ipod set up is made by cycle tunes. There is a small amp and 2 handlebar mounted speakers. You can get either 2, 2 1/2, or 3 inch speakers. I have the 2 1/2 inch, but if you've got the clearance, I'd go with the 3s. They sound pretty good for what they are. Depending on your windshield set up, they might be hard to hear on the freeway. One accessory for them that's a must is the auxiliary volume control. I've got one coming this week. The connector uses the headphone jack, so any mp3 player will work. My bike had the 2" speakers when I got it and they were awful. Shop around, because prices vary a bit online. Ride on and ride safe!! !